Civil War Tours of New Orleans is the only tour business officially allowed to conduct tours from within Metairie Cemetery. With only forty cemeteries throughout New Orleans, Metairie Cemetery was the first cemetery to be privately owned, open to any and all who desire to be laid to rest there. Unlike the other cemeteries in New Orleans that are owned and maintained by a church, or fraternal order, Metairie Cemetery has been privately owned since 1874, and only Civil War Tours of New Orleans is officially allowed to give tours from within the cemetery. On this tour, you will visit the final resting places of prominent soldiers and citizens from the Civil War, and learn about their life and how they impacted this country during the Civil War. All Metairie Cemetery tours begin with guest being picked up from James Cohen & Sons, located at 437 Royal Street, in the heart of the French Quarter. Guests will be transported to Metairie Cemetery in a luxury SUV. 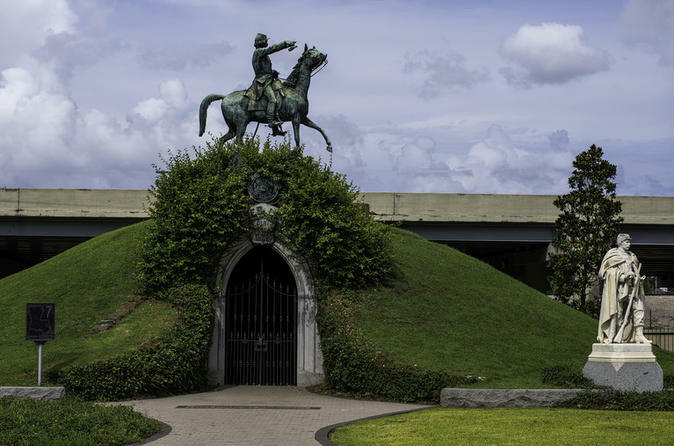 While on your way to Metairie Cemetery, guests will learn a little about New Orleans at the time of the Civil War, as a way to prepare guests for their visit of Metairie Cemetery. Once the tour arrives at Metairie Cemetery, the tour will be a combination of driving and walking. Guest, while riding from within a luxury SUV, will depart from the vehicle and then will be given history of the cemetery from colonial era to the present, along with how the cemetery played a role during the Civil War. After an introduction, guests will enter the vehicle, and will be driven to the next tour stop location, where they will again depart from the vehicle, and will be told about the person whom we have stopped to talk about. The tour will continue as a combination of driving and walking all throughout the cemetery, allowing guests to visit and pay their respects to the final resting place of soldiers and civilians from the Civil War, while enjoying the beautiful surrounding of Metairie Cemetery, arguably the most beautiful cemetery in all of New Orleans. Following the tour, guests will be taken back to the French Quarter to where the tour began, unless requested to be taken elsewhere.